Santander has been pummelled even more than most European lenders. It has been easy to construct a bear case around the Spanish bank based on its Brazilian exposure, weak capital, poor momentum in Spain, and regulatory problems in the United States. But a valuation below tangible net asset value is too unkind. Brazil’s dysfunction is both economic and political. Santander’s local unit, which accounts for about a fifth of group earnings, has been reducing loans to riskier clients. Provisions against bad loans rose a fifth in local currency terms in the fourth quarter of 2015, it reported on Jan. 27, against the same period a year earlier. Meanwhile, Santander’s fully loaded core Tier 1 capital ratio, the measure of capitalisation regulators care about most, is still well below peers at just over 10 percent. Santander’s home market paints a brighter picture. The Spanish economy is growing at a healthy clip and bad loans are falling. But competition among banks to make new loans, ultra-low interest rates and weak demand for credit are hitting net interest income. Yet how cheap is too cheap? The bank’s share price has declined by around 45 percent since Ana Botin took over as chief from her father in 2014, against about 37 percent at rival BBVA. Santander trades at 8.2 times 2016 earnings, according to Eikon estimates, below 10.4 for peers. Santander also trades at a big discount to the sum of its parts. Based in part on market prices for listed units from early January, analysts at Exane BNP Paribas estimate Santander would have a market capitalisation of 74 billion euros, including losses from the corporate centre, compared with a current value of 57 billion euros as of Jan. 27. As for capital, Santander can make the case that it needs less padding than peers. It predominantly does relatively low-risk retail banking, and is well diversified. But the risk of a jumbo capital raising is low, mainly because the share price is some 35 percent below the price at which it raised capital a year ago. That gives management a powerful incentive to rebuild capital slowly, and the old-fashioned way – by growing earnings. Santander boosted its capital ratio by 40 basis points in 2015. It’s enough to think a recovery is due. 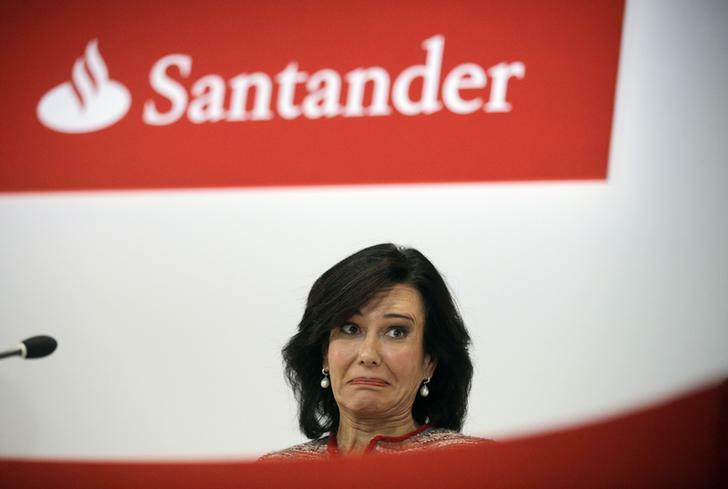 Ana Botin, Chairman of Banco Santander, reacts during the bank's 2014 results presentation at the company headquarters in Boadilla del Monte, outside Madrid February 3, 2015. Santander announced a 2.6 percent increase in earnings to 6 billion euros for 2015. Excluding extraordinary charges, profit grew 13 percent, the Spanish bank said in a statement on Jan. 27. Earnings were 1.5 billion euros in the fourth quarter of 2015 excluding non-recurring charges, up 0.3 percent against the same period a year earlier. Compensation for British customers mis-sold payment protection insurance (PPI) accounted for 600 million euros of 1.4 billion euros in one-off charges. Including those charges, earnings fell 98 percent against the fourth quarter of 2104. Provision for bad loans rose 4 percent against the same quarter a year earlier to 2.6 billion euros. In Spain, where Santander makes 12 percent of its earnings, net interest income fell 16 percent against the same quarter a year earlier. Brazil accounted for 19 percent of 2015 earnings, while the UK contributed 23 percent. Santander said it was on track to meet a goal of achieving a fully-loaded core Tier 1 capital ratio of above 11 percent by 2018. The ratio was 10.05 percent by the end of 2015, up 40 basis points in the year. At 0955 GMT, Santander shares were down 0.9 percent at 3.95 euros a share.